Classic head Half Eagles were produced at the US Mint from 1834 to 1838. The Mint Act of 1834 mandated that the weight of the Half Eagle be reduced from 8.75 grams to 8.36 grams in order to discourage exporting and melting. 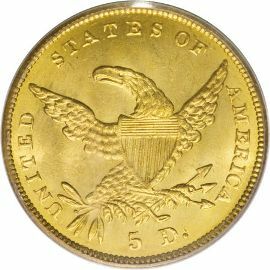 This 5 dollar gold coin is, for the most part, readily available in most grades, with minimal searching. 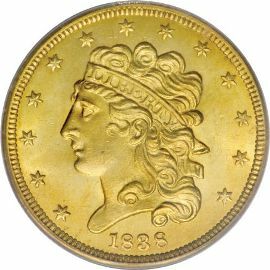 Any gold coin collection would be enhanced by adding one of this particular type, as they are highly sought after. left, with thick and curly locks confined by a headband inscribed with "LIBERTY". A circle of 13 stars surrounded the entire design, with the date below. the previous issue. It is surrounded by the inscriptions "UNITED STATES OF AMERICA" and "5 D.". The motto "E PLURIBUS UNUM" is omitted from this design to indicate the change in weight.